Background Historically, Sellwood was more attached to the Willamette River than it is today because people traveled by water. Other river communities, such as Oregon City and Milwaukie, were connected to Sellwood by steamboats that landed at the foot of Umatilla Street beginning in the early 1850’s. Opening of the Sellwood Bridge in December of 1925, signaled the closure of ferry service from the foot of Spokane Street to the landing next to present-day Staff Jennings. Due to transportation changes, most of us no longer have the daily contact with the river that earlier residents experienced. However, residents at the Oregon Yacht Club (OYC) are a group of neighbors in the Sellwood/Moreland area that have over a century-long relationship with the river. Historical Events The Oregon Yacht Club’s history is fascinating. The OYC was originally located about 1898 just South of the old Madison Street Bridge (now the Hawthorne Bridge). Official records indicate that OYC incorporated on October 1, 1900 with the purpose being to foster and encourage yachting and to promote and increase the efficiency of its members and others in the science of navigation and the art of handling and sailing yachts and other vessels About 1904 the Club moved upriver to its current location that is downstream from the Sellwood Bridge and just North of Oaks Park. 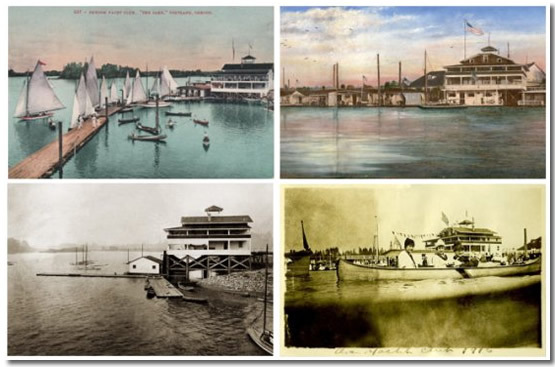 According to the Oregonian on February 24, 1900, the Club most likely decided to relocate upriver, because its yachting activities were being restricted by the scowhouses (or houseboats) in front of the Club’s grounds…. the floating population here seems to have preempted the place, and are hard to move. By 1910, yachting expanded to include canoeing, rowboats, small sailboats, and was soon followed by motor boats. In addition, OYC started allowing houseboat living in summer residences, which eventually evolved to the year-round homes of today. Also established in the early years were traditions such as the annual summer Regattas, Dances and the Commodores Ball. As reported in a 1933 Oregon Journal article, OYC’s sponsored regatta in 1932 drew 2,000 persons to view competitive swimming, diving, canoe, rowboat and motor boat races, as well as jousting and clowning. Unfortunately, OYC’s attractive three-deck club house was destroyed by a fire in 1943, ending the annual regatta, one of the club’s most favored and traditional events. Today, the OYC moorage is still at the same location, on the East side of the Willamette River adjacent next to Oaks Park. The community on the water is now a modern-day houseboat community, with a predominance of two-story buildings replacing the traditional one-story residences. The club is currently comprised of 38 floating homes (as they are called today!) that are permanently situated at a particular slip (submerged land space) on the moorage and attached to pilings and the walkway. Although keeping its original title as a Club, OYC is more truly a corporation of shareholders, each who has purchased a share and a houseboat in order to reside in a water space (a slip) at this moorage. Attesting to the fortitude of its members to survive and flourish as a community, OYC has overcome major setbacks over the years, including its Clubhouse Fire of 1943 and natural disasters such as the Columbus Day storm of 1962 and major floods during 1956, 1964, 1965, and 1996. The OYC has also managed to hang onto some of its valued traditions: the nautical titles for several of its Board Members (Commodore vs President, Vice-Commodore vs Vice-President, and Rear Commodore vs Past President); its annual inspection of houseboats to make sure they are in shipshape; and its striking display when all houseboats are asked to fly Old Glory each year from spring to fall (from Memorial Day to Labor Day). Celebration The historical Oregon Yacht Club celebrated its 100-year anniversary on October 1, 2000, as the first organized yacht club in the Portland area. The OYC residents held a Share Your Memories Program and an Old Fashioned Ice Cream Social at the Dance Pavilion at Oaks Amusement Park. It was a highly successful and well attended event. The celebration provided opportunities for friends, neighbors, guests, and moorage members (past and present) to reminisce about the exciting history of this Club through the sharing of stories, photos, and memorabilia from years gone by. The day of celebration ended with tours by Willamette Jet Boats along the front of the moorage to show visitors OYC’s evolvement to a 21st century floating home community. Note: This overview is adapted from the article originally written by the author who served as the OYC Commodore during 1999-2000. The original article was submitted to the BEE newspaper for inclusion in their August/September 2000 issue.